You’ve probably heard the term “negative amortization” by now, as the subprime industry goes down the drain and option-arm mortgages get replaced by 30-year fixed mortgages. Negative amortization is a complicated and highly scrutinized subject, but I’ll try to simplify it here. Let me start by defining amortization as the reduction of debt by regular payments of interest and principal sufficient to pay off a loan by maturity. 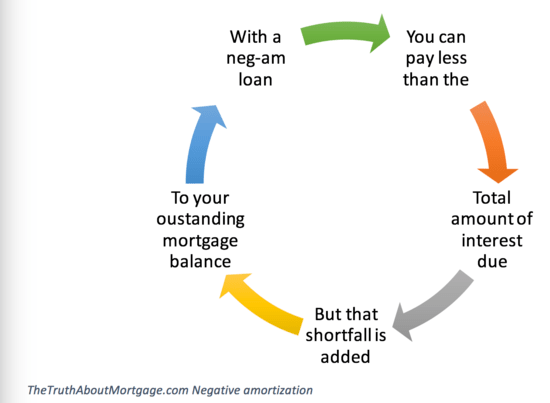 Now that we know that, negative amortization must be the result of a mortgage repayment plan in which the borrower makes monthly payments that are less than the minimum amount of interest due. This difference in interest is then added to the outstanding loan balance, causing the overall loan balance to increase. Negative amortizing loans are also known as option-arms or “neg-ams,” as well as other creative names such as “flex-saver” or “power option” and similar low payment, money-saving titles. In our example above, the difference between the interest-only mortgage payment and the minimum payment at 1% (fully-amortized) is $1430.17 a month. This is known as “deferred interest.” It’s also the amount that will be added onto the overall loan balance because it’s below the total minimum amount of interest due. I used the interest-only payment because that’s the absolute minimum a borrower can pay to avoid negative amortization. So anything below that amount must be added onto the existing loan balance each month. Remember, the bank or mortgage lender will typically allow you to make a 1% minimum payment, but the difference in payment has to end up somewhere. And that somewhere is on top of your loan balance. This is where many borrowers got confused, and some were ultimately foreclosed on or had to refinance to save themselves and their homes. What is deferred interest on a mortgage loan? Many borrowers would pay the 1% payment option each month, thinking they were getting a deal, not realizing that they were accruing an even larger loan balance than they originally set out with. The problem is that once the 1% payment option goes away, typically within five years or when the loan balance hits 110-115% LTV of the original loan amount, the borrower must make the interest-only payment at the very least to avoid any additional negative amortization. By making the interest-only payment, you are assured no negative amortization because all interest due is being paid, leaving no difference to be added onto the loan balance. However, once your loan recasts, if you experienced tons of negative amortization from making the 1% payment for months on end, you’ll end up with a much higher interest-only payment because of a higher overall loan balance that may become unmanageable, especially if you were used to making such small payments. It’s important to note that negative amortization loans were originally intended to be used as flexible payment options, where a borrower could make a small payment one month, then the full payment the next. It made sense for borrowers who got paid seasonally or only got paid after completing large projects, who may not have had the money to make the full payment in a given month. It also worked when homes were appreciating at a rate greater than the interest rate of the mortgage. Unfortunately, many mortgage lenders, banks, and mortgage brokers advertised “neg-am loans” as a low payment mortgage, without explaining the complicated negative (no pun intended) aspects. And many were used simply because it was the only way a borrower could qualify for a home loan, not that they we’re truly qualified at the fully-indexed rate. The result has been and will be increased mortgage defaults and foreclosures. Before getting into a negative amortization loan, make sure you fully understand how it works and that it suits your unique situation.